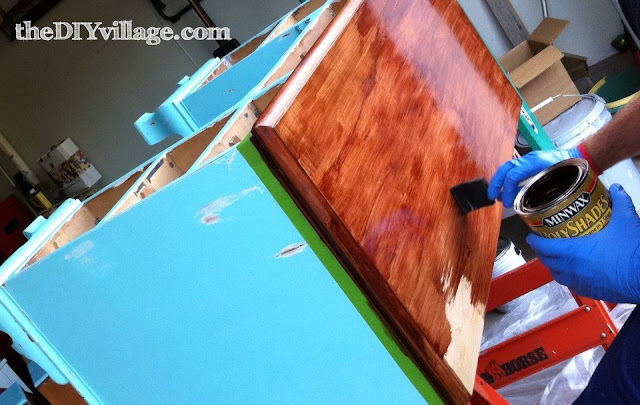 My wife, Jacque loves to scour Craigslist looking for treasures that we can refinish or even reinvent to fit our style. Since she’s so dedicated to searching, I find myself at times joining her for the treasure hunt. I ran across a desk that a mom had painted for her son 20+ years ago. We settled on a purchase price of $25 and back to our house it went! Whew, what a paint job! Once we got to really inspecting the work we needed to do we found that this was actually an old Naval desk! It was written on the back of the desk and inside one of the drawers! I found that to be an added “cool” story to go with the desk! The first thing we needed to do was to remove as much paint as possible! We used a combination of different techniques to remove the paint. We used a combination of hand scrapers, heat guns, palm sanders, belt sanders, and even an oribital sander. The paint removal took a total of about 8 hours over a 2 day period. Next we primed the drawer faces and the frame of the desk with a Kilz Multi-Purpose Primer. Jacque decided to stain the top of the desk, so we left it unprimed. The next step was to paint the drawer faces and the frame. We opted for a Benjamin Moore paint we found at Ace Hardware discounted as a “mis-tint”. I think we may have paid $3 for the quart of paint. 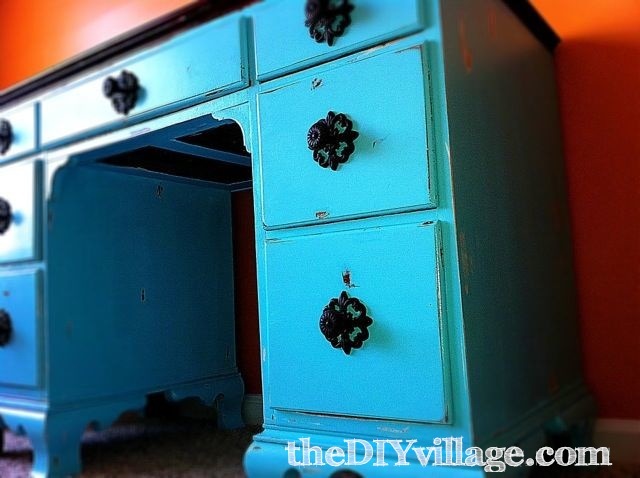 Before applying a finish coat to the desk, Jacque had the idea of distressing the frame to give it a more “vintage” look. We used some cabinet scrapers from Woodcraft…And let me tell you, those are SHARP! So if using them, be extremely careful holding them. I made the mistake of loosely holding a scraper while using it and ended up having to take a “safety timeout” because it slipped and cut my thumb. It’s easier to see the distressing in the final pics below so I’ll forego posting any here. We used a poly-acrylic made by MinWax to seal the desk. And lastly we used PolyShades made by MixWax to stain and seal the top surface of the desk. It’s a stain and poly combined and after a few sandings and applications, the desk top looked immaculate! We moved the desk into Jacque’s Craft Room and added some decorative knobs we got at Hobby Lobby. And after 4 days of refinishing and less then $50 spent, here’s the final result. 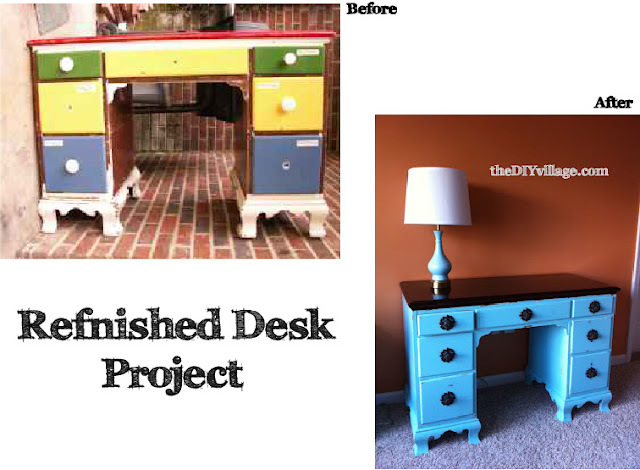 Check out the before and after of our refinished desk. That color is gorgeous! Great job! Not bad for a miss-tint is it? Thank you so much! I love it so much, just perfect in my craft room! Such a great transformation. I love it! Looks great!!! Awesome color too! WOW! 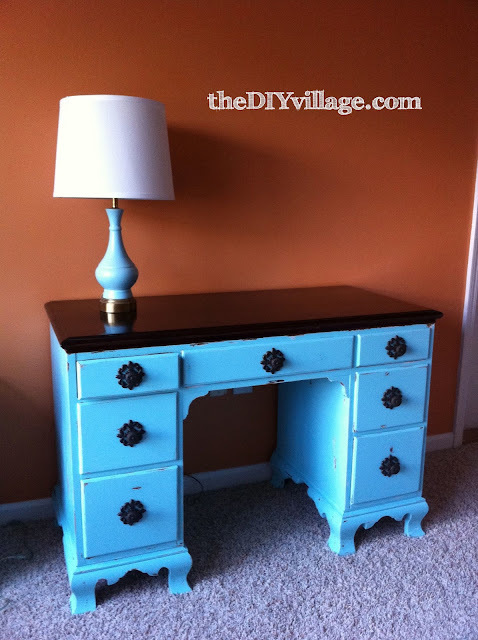 Who knew such a gorgeous desk was hidding underneath all of that paint? AWESOME! LOve the hardware as well- great job! Thanks for linking up – please stop back this week to link up again! LOVE your craft room desk! Thanks Katie!!! Now if only I had the nerve to actually use it! I'm so afraid I will mess the top up … I may need to invest in some glass to put over the top! Hey guys. I love this color…so much that I highlighted it as one of my inspiration pieces today on Curb Alert! 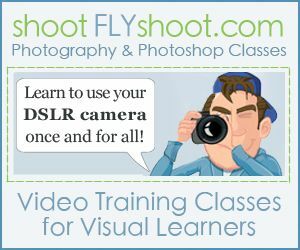 If you have any other blue projects that you have worked on I would love for you to link them up as well to get the link party kicked off. Whoa! You guys did do a great job & I too like the color. It’s pretty cool it was an older naval desk. I’m a new follower from Google+!